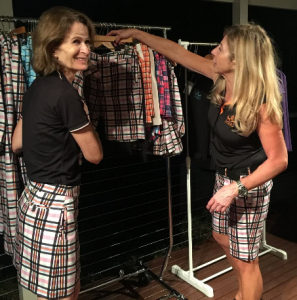 Pohli Women's Golf Apparel - What's in a (Golf Club) Dress Code? Unlike most sports, golf has specific rules and regulations as to what you can and cannot wear both whilst playing a round or in the club house. Although there are some common dress guidelines there are also significant differences, depending on whether you are playing at a resort course (usually more relaxed) or private club. Sometimes there’s just too much choice! Once you’ve joined a golf club or play regularly at the same course you’ll soon work out what passes as ‘acceptable attire’ – and it’s really not so daunting – but to start with, here’s a few simple guidelines to make sure you look the part. Wear a collared golf top, or a polo-style neck. Short sleeve or long sleeved golf tops are usually fine. Sleeveless golf tops are accepted at many clubs but can be an issue, and casual tops like tank tops are a definite ‘no’. 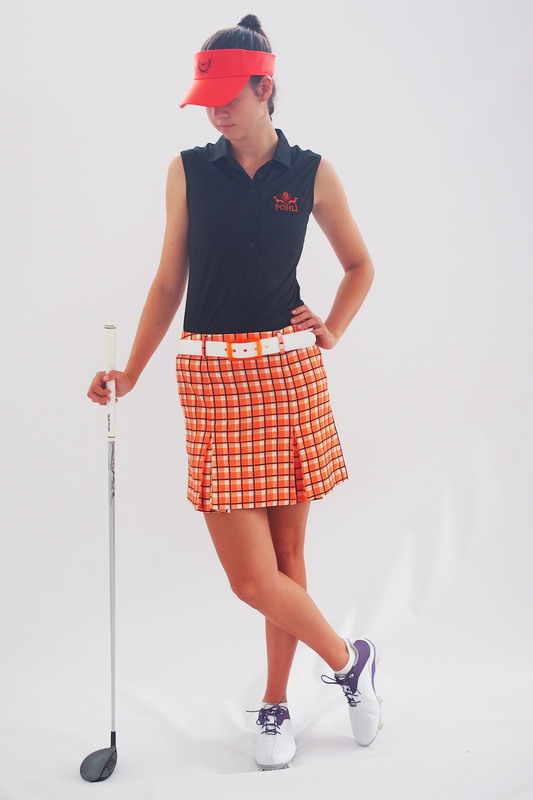 The top should be tucked in, although for women most clubs allow the top to be worn outside of the golf skirt or shorts, providing it is a reasonably tailored fit and not too long and/or baggy. Anything with the hem sitting between the waist and hips should be ok. Nothing skin tight or see-through, no mid-riff tops and no revealing necklines. It’s fine to wear golf shorts at the majority of clubs. Acceptable length is mid-thigh (similar rules as for skirts). As for golf pants, avoid cargo style shorts. Jeans (of any colour) pants with stud details and cargo pants are not accepted at most clubs, although most do allow slim fit trousers. Safest bet is to go for a golf pant with a tailored cut. There aren’t too many golf dresses about, but they can be a really good option. Follow the rules for necklines and skirt lengths and you’ll be fine. Although you’re likely to be confronted by a sea of beige, navy and khaki, as far as we can find there are no dress codes that limit the colours or patterns you can wear, so it’s a good opportunity to have a bit of fun! Large and obvious logos, however, are usually not acceptable, particularly if not golf related. Shoes: you should wear proper golf shoes with rubber spikes. Borrow them if you have to. It’s not just about giving you a firm stance as you’re playing, it’s also an issue regarding the care of the course, and the greens in particular, so running shoes and non-golf specific sports shoes are usually not appropriate. Socks: ankle or anklet socks in white are usually ok for ladies. Golf visors/hats: Not usually the subject of any particular dress regulation. Visors or caps are the most common choice, although some ladies opt for wider brim hats for sun protection. different clubs have different rules as to whether you can wear your golf shoes inside the club house so to be on the safe side, always bring a pair of smart casual shoes (not open sandals or thongs) to change in to if you’re planning to have a drink or lunch after your round. always take your cap or visor off when entering the club house. check the rules regarding use of mobile phones. Generally not acceptable on the course or clubhouse except in change rooms or car park. if you’re participating in an event with a lunch or dinner afterwards in the more formal part of the club, check whether you can still wear your golf clothes or whether you need to change. Do you have to buy your golf wear from a golf shop? No. However, some clubs apply the guideline that if you’ve bought your clothes from a recognised golf shop, or golf wear brand then that constitutes ‘acceptable golf wear’. We suspect though that as some manufacturers and retailers ‘push the boundaries’ this strategy could still land you in trouble. It’s an unwritten rule that many very low handicappers and golf professionals are able to wear clothes that would not be acceptable for social players at the majority of clubs. 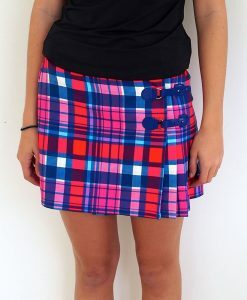 So just because you see Natalie Gulbis or Michelle Wie looking great in a very short skirt don’t assume you’ll get away with it too! The fail-safe solution is to ask! If you’ve been lucky enough to have been invited to a visitors day or corporate event make sure to check with the club or your friends to see if there are any particular dress rules for that club. There are some important variations between clubs, and the last thing you’d want is to cause any embarrassment to the member who has invited you! This entry was posted in Golf Pants/Shorts, Golf Tips, Golf Tops, Skirts, Women's Golf, Women's Golf Apparel. Bookmark the permalink.